Published Thursday, March 12, 2009, OK personal/derivative use; link www.lovethatimage.com. You can’t beat sunsets for enjoying looking at skies. I don’t know why we love them so, but we do. Add in a few boats and a still evening, and we are so happy to be there. The magic of photography is that we can keep those moments, and remember. Happy Skywatch Friday to you all! For more beautiful skies around the planet, click HERE. Congratulation for being the HOST today. Beautiful sunset with silhouette of boats. Your picture of fishes and green are beautiful too. Simply beautiful and invites relaxation of mind and spirit. Happy skywatching. Sara: What a neat capture of the sky through all the boats. Very beautiful and peaceful photo Sara, I love it. Oh, I so want to be there! The texture of the clouds is almost as pretty as the colors! That’s a perfect shot through the masts – it really makes it into something special. I love the boats in the foreground shadowed under the setting sun. I like the busyness of the masts with the sunset in the background. Wonderful! Congratulations for the Skywatch cover today. Beautiful photo! I love how the masts and to a smaller degree the mountains in the background are reaching for the fiery, yet fluffy sky. The corner of water is also an interesting touch. It almost feels like it contrasts or even somehow mirrors the opposite corner. Simply wonderful color on the sky! And the boats in the forground is perfect! And congratulations with a great shot on the SkyWatch cover today! You’re right, all the elements are right there! Another beauty from you, Sarah. Delectable! The sky is so beautiful and I love the way the sailboats masts look against the sky. Wonderful image at so many levels. 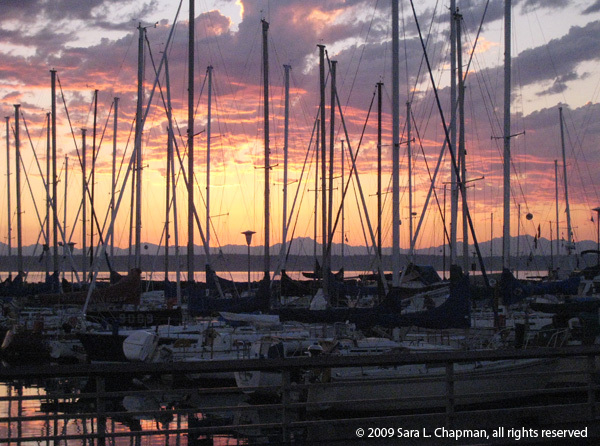 Boats, masts, sea, clouds, color, your photograph has it all. Have a good weekend Sara!! An awesome sky for skywatch and a cool shot for the host page. colourful. Your photo is very striking! Have a great weekend. Oh Sara, I forgot to say that the kitten and bird drama was sent to me by Patty Lincoln. I don’t know who the photographer was. Thank you for hosting Skywatch Friday. Don’t know what all that entails but it is a great meme and great service to the blogosphere! “We are all alike; we are all different.” Ditto the sky shots. Beautiful photo!! I love the colours in the sky, and reflected in the water! And the forest of masts gives it all perspective – the masts are this big but the sky simply overwhelms them and makes them small! I really like this. Love the pink against the soft variations of grey. Really nice! Really nice photographs!! Gorgeous colors. Sara, that is amazingly beautiful! All those masts(?) scoring the sky with amazing blazes of color blasting through. I’m so thrilled you were there to capture it and wanted to share! Awesome! Color and composition are fantastic. Ohh! Ahhh! Beautiful scenery! Beautiful sky. I love it! Harbor shots always call me to wish I was there. Oh well. Lovely shot!